Mid Summer’s day and we are still ticking over nicely. Since my last update we have 18 fish landed. There are also a few grilse beginning to appear as 7 of the 18, I would consider to be grilse. Finlough has been by far the most productive with 16 taken from it, with 1 each off Doolough and the river. Many of the fish on Finlough were also sea liced which means they were obviously running straight through the river, without the slightest interest in what was thrown in front of them. Will we ever figure them out? I hope not!! On Saturday last we had an outing for the ghillies and there were 4 fish landed all off Fin. Sunday we had 6 fish, with Michael Darling, Peter Joyce and Paul Wymes all landing fish off Fin, weighing in at 3lbs12.5ozs, 5lbs12ozs, 6lbs12ozs, 4lbs11ozs and 7lbs5ozs. They were taken on Cascade’s, Foxford Shrimps and Collie Dogs. Jim Flanagan also had a fish off Doolough of approx. 8.5lbs. We drew a blank Monday, but then on Tuesday Michael Darling had one of 5lbs13ozs on a Cascade and Mike O’Neill had two, one of 3lbs and one of 7lbs2ozs, both on a Willie Gunn. Wednesday, Michael Darling had his third, a fish of 4lbs11ozs on a Stoats Tail. Yesterday, we landed four. Charles Cooper had one of 6lbs15ozs on a Green Highlander and then his guest Matthew Rogerson had the only fish off the river, of 8lbs2ozs on a Yellow shrimp from the Meadow pool. Then John Sommerville’s birthday party goers managed to land two off Fin. 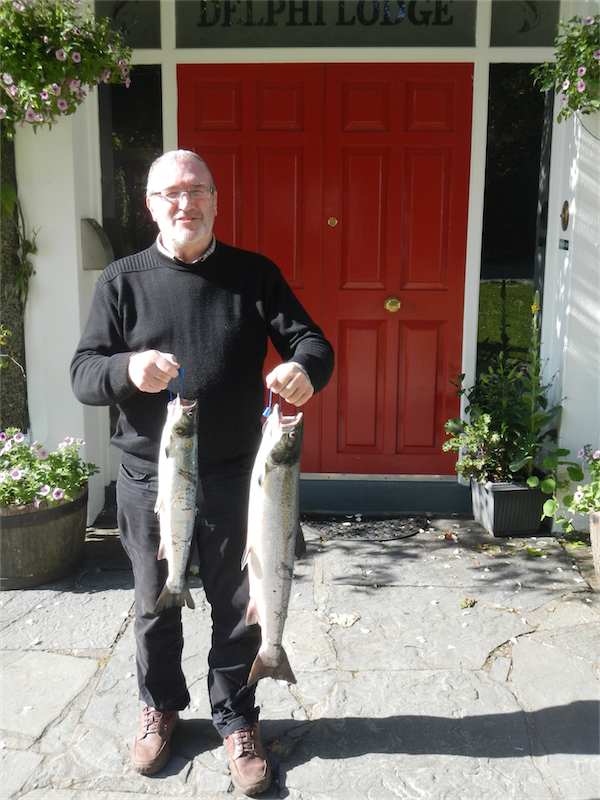 Noel Murphy landed his first ever salmon, of 6lbs12ozs on a Delphi Collie and John actually managed not to step on his line this time and landed a 6lbs6ozs fish, also on a Delphi Collie. Just in case you’re all wondering John was actually 30. Finally today Matthew Rogerson had his second, a fish of 4lbs11ozs on a Yellow shrimp again. At the moment it’s raining, so hopefully it will be enough to bring up the river which is at 20. A rise in water would put us in good stead for the days to come.